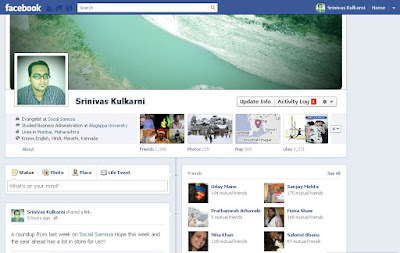 Social Samosa - Facebook Timeline for everyone! A lot of us were totally swept away by the introduction of Facebook Timeline at the Facebook F8 conference in September. A completely amazing redesign of the Facebook's user profile page, it lets us showcase the Timeline of our life on Facebook. Besides just updating information and interests, this feature allowed people to showcase their life right from birth till date, in a theatrical fashion, creating a story of their lives. Those who still don't know about the Timeline, (which is highly unlikely), can get some insights by watching this video. So, just yesterday at work, one of my colleagues was asking me on how to go about activating the Facebook Timeline. Since I didn't quite remember the steps to it, I looked up an old article on Techcrunch where one had to create an app and do a couple of things via the developer mode. Nonetheless, Facebook finally launched the Timeline for everyone and now, after gradual roll-outs and testing for months, we don't have to hack or wrack our brains too much - it's easily available to all users now. Social Samosa - Do you Feel UP or Let Down? Social Samosa - How brands can use #NewTwitter?